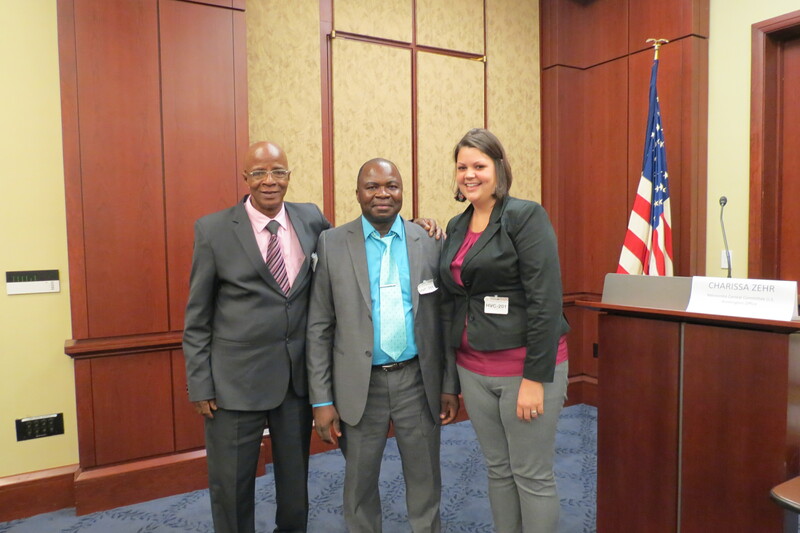 Javes Benitez (left) and Rutilio Rivas, Mennonite Brethren leaders from Choco, Colombia spoke at a briefing in Washington, D.C. about the harmful effects of aerial fumigations on cacao-growing projects. The Colombian government later announced it was ending the aerial fumigations program. On the right is Charissa Zehr, MCC Washington staff. As I write, I am struck by the dissonance between the words we proclaim in our churches during Advent–hope, peace, joy and love–and the ugliness of much of our public discourse in this country. It seems to have become acceptable–maybe even a badge of honor–to spew hatred toward Muslims, refugees and others who “aren’t like us.” All too often the people making these statements identify as Christian. These moments provide an opportunity to examine who we really are, as followers of Jesus. Will we take seriously the fact that Jesus did not hesitate to associate with all kinds of people, including people with whom he seemingly had little in common? Will we take note that when we offer food to those who are hungry and visit those who are in prison, we are doing so for Jesus? Will we wrestle with his refusal to take up violence and weapons against the oppressors of his day? Here in MCC’s Washington Office, our witness to governing authorities has the most integrity when it is rooted in the experience, wisdom and practice of the church. If we put down Muslims or people of other faiths in our own individual conversations, how can we call on government officials to model respectful discourse? If we are not welcoming to refugees in our local congregations, how can we call on members of Congress to support the refugee resettlement program? The hard work begins with deciding who we will be as members of the body of Christ, each and every day. It is easy to become overwhelmed when we think about the problems of our day–racism, income inequality, climate change, gun violence and terrorism. The problems seem so big and our efforts seem so small. When God called the prophet Jeremiah to be “a prophet to the nations,” he protested that he was too young, too inexperienced, not up to such a daunting task. God reassured Jeremiah that he would give him the words to say. One step at a time, one word at a time, we must choose who we will be as followers of Jesus. We must seek God’s grace to live out hope, peace, joy and love in our personal lives, congregations and communities and then to speak with integrity and authority to governing officials. Together: “Now I have put my words in your mouth.